George Washington Orton was born on January 10, 1873, in Strathroy, Ontario, the son of Oliver Henry Orton and Mary Ann Irvine Orton. After being crippled in an accident as a child, young George turned to exercise, particularly running, to overcome his injury. He soon discovered he had a natural gift for long distance running. 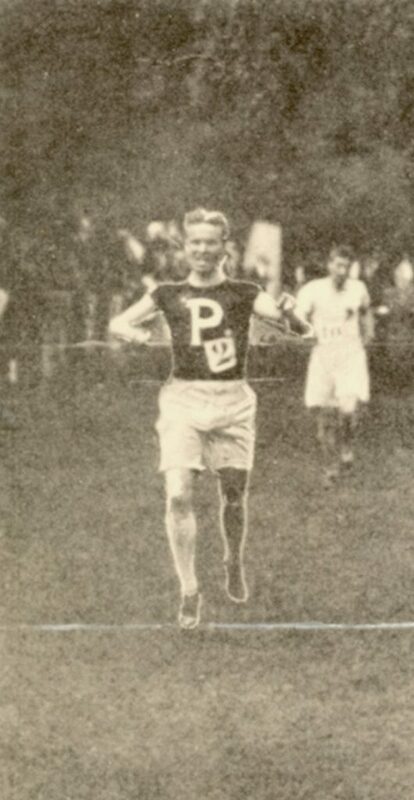 During his years at the University of Toronto, Orton dominated the half-mile and mile runs at meets in Canada and the United States. After graduating with double honors in modern languages, he entered the University of Pennsylvania to study romance languages in the fall of 1893, earning an M.A. in 1894 and a Ph.D. in 1896. He remained for one more year of graduate work, and eventually became fluent in nine languages. At Penn he was a member of Phi Gamma Delta, and most notably, captain of the Penn track team in 1895 and 1896. As a Penn student, he won two intercollegiate one-mile championships, in 1895 and 1897; like fellow gold medal winner John Baxter Taylor, his successes at the 1900 Olympics were also as a member of the University of Pennsylvania delegation. Orton competed in track and field from 1892 to 1903. Highlights of his track career include being in championship runs at the 1893 World Fair in Chicago and at the 1900 Paris Olympics, where he won a gold medal in the 2,500 meter run and a bronze metal in the 400-meter hurdles. His numerous other athletic achievements included American championships at one mile, 10 miles, cross country, steeplechase, and English steeplechase. Orton was also an outstanding athlete in other sports. He played on Toronto’s All-Star soccer team, and was still playing soccer in Philadelphia for the Merchantville Club in 1923. He started hockey at Penn and played on its first team; he played ice hockey in Philadelphia until 1934. In later life, he was also secretary of the Rose Tree Fox Hunting Club of Media, Pennsylvania. For the first years after completing his graduate studies, Orton combined his own sports participation with teaching and coaching at the pre-college level in the Philadelphia area. From 1897 until 1908, Orton taught languages at Eastham Academy, the Blight School, and then at Banks Preparatory School (as headmaster) and Episcopal Academy (as teacher and coach of track and field). During the summers of 1899 and 1900 he participated in track events in Europe, including England, France and Belgium. He also founded two New Hampshire camps, Camp Tecumseh in 1902 and Camp Iroquois in 1916. During the first decade of the twentieth century Orton originated the Children’s Playground Association in Philadelphia and wrote his Athletic Training for School Boys, published in 1905. Sometime shortly after 1900 Orton joined with Frank B. Ellis, Law 1893, to assist in the managing of the Penn Relays; in 1895, Ellis had devised and managed the first Intercollegiate and Interscholastic Races (known as the Penn Relays) at the University of Pennsylvania. Orton coached track and field at the University at various times between 1912 and 1924. Before World War I, Orton was a co-author of the History of Athletics at Pennsylvania in several volumes. He also wrote other books on athletics, including sports and camp life books for boys such as the Bob Hunt series. He also originated the Children’s Playground Association in Philadelphia. In 1925 Orton was appointed director of athletics for the Sesqui-Centennial International Exposition, held in Philadelphia in 1926. From 1928 to 1934 he was director of Philadelphia’s Municipal Stadium. He also played an important role in bringing the Army-Navy football game to Philadelphia. Orton was a member of the Belmont Cricket Club, the Merion Cricket Club, the New York Athletic Club, and the University of Pennsylvania Track Club. He was also named a member of the American Academy of Poets. From 1941 until his death June 25, 1958, he made his home with his step-daughter, Doris B. Bolton, in Center Harbor, New Hampshire.